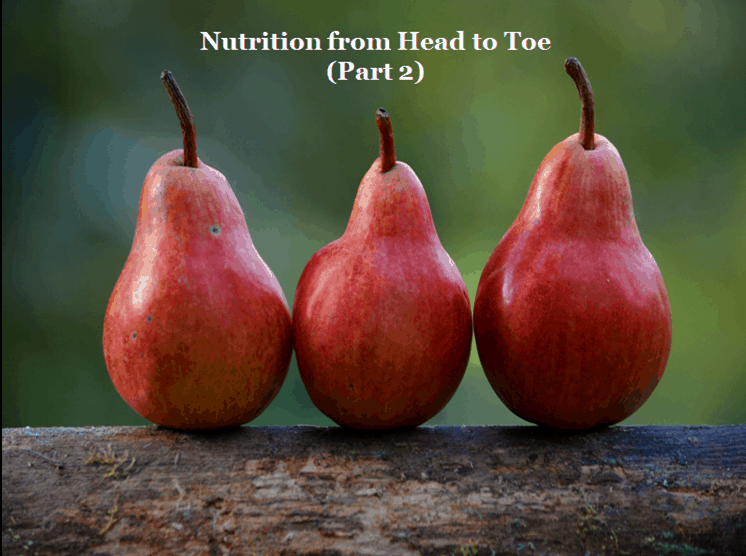 In this post (Part 9 of Growth and Puberty Series), we are continuing on the nutritional needs during puberty. In Part 1, we covered the brain, eyes, blood, and heart. Now we are digging into muscles mass, body fat, bone, collagen, the GI Tract, and skin. One of the key tissues to expand during puberty is muscle mass, especially in boys. As muscle mass increases so do energy requirements. Physical activity also benefits muscle development. In children and young adults, uneven meal distribution of protein appears not to adversely affect growth. The anabolic drive maintains high efficiency of protein use for nitrogen retention even when daily protein is consumed as a single large meal. However in older adults, the quantity and quality of protein at individual meals is important…This response appears to be determined by the essential amino acid leucine which serves as a critical signal for triggering initiation of muscle protein…In children and young adults, this signal pathway is regulated by insulin and dietary energy while leucine regulates the pathway in adults. Bottom line: Adolescents need quality carbohydrates, protein, and fat to grow up to be healthy and strong. 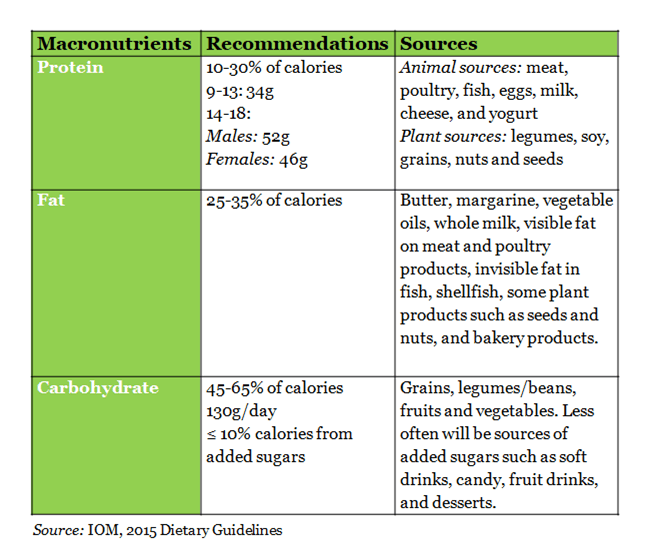 These macronutrients provide the energy needed for growth. No need to calculate grams, just provide a good balance of the three macronutrients considering intake over a week instead of a day. I dedicated an entire post to bone growth during puberty. Don’t miss it! The most abundant protein found in the body, collagen, is found in bones, muscles, tendons, and skin. Because vitamin C aids the production of collagen and other connective tissues, it’s important during rapid growth and development. 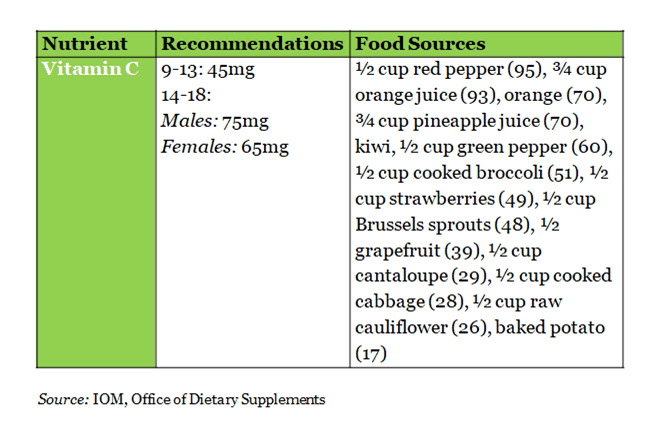 Vitamin C is falling short in many adolescents diets most likely due to a dip in fruit intake. 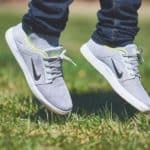 For example, 17% of 9-13-year-old boys are below the estimated average requirement and that jumps to 39% at 14-18 years. For girls, those numbers are 23% and 35% respectively. 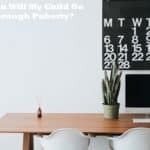 There’s a lot more food going through the gastrointestinal tract and that means constipation — and stomach issues — can become an issue. Most adolescents get about half the recommended amount of fiber that helps not only with bowel movements but the growth of good bacteria in the gut. Eighty percent of teenagers will get acne at one time or another. Acne is caused by an upswing in hormones that increase the production of an oily substance called sebum. When sebum combines with dead skin cells and/or debris it can block follicles. Acne occurs when these follicles get inflamed. 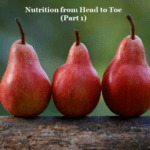 Not all nutrients fit neatly into the head to toe example. Two of particular importance are vitamin E and zinc. Vitamin E, with its antioxidant properties, is important during periods of rapid growth and development. And zinc is associated with more than 100 specific enzymes and is needed for the formation of protein. Zinc blood levels tend to decline during the rapid growth and hormonal changes of puberty. 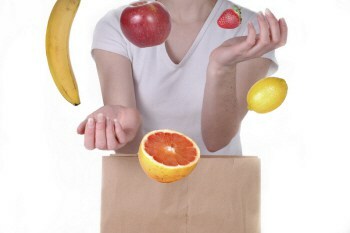 Vitamin E is a shortfall in most children’s diet and that includes tweens and teens. 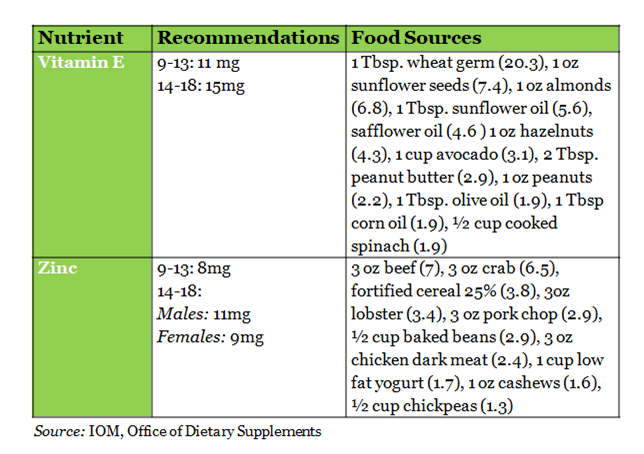 According to the 2015 Dietary Guidelines, 87% of male 9-13 year-olds don’t meet the estimated average requirement for vitamin E. That jumps to >97% at 14. Females get even less with 93% of 9-13-year-olds falling short on vitamin E with that number jumping to >97% at 14. Zinc is better in males with <3% meeting less than the estimated average requirement at 9-13 years of age jumping to 5% at 14. For girls, those numbers are 6% and 21% respectively. While a food first approach is always preferred reality tells a different story. Studies suggest multivitamins with minerals help fill gaps during the adolescent growth spurt. Because multivitamins contain small amounts of key nutrients like calcium and DHA, they may need to be given separately depending on the child’s diet. 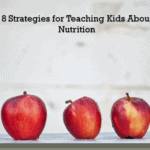 In the next post, we’ll talk about ways to make nutrition come alive for children during puberty, increasing learning, confidence, and diet quality.